“As an orthodontist, I am most passionate about helping others obtain a smile they will cherish for a lifetime. “I know the transformative power of braces: I loved going to the orthodontist when I was a child, and still recall how amazing it was to see my new smile and the confidence that gave me. I knew then that I needed to share that experience with others! “When I meet a new patient, I focus on what they tell me about their treatment goals, concerns, and day-to-day life. Following the initial exam, I design a fully customized treatment plan that addresses the whole of the situation. I make the process efficient and comfortable, improve oral health and bite, and create a smile that’s natural-looking and pleasing. Throughout the year, Dr. Frels takes advantage of numerous continuing education offerings. Doing so keeps her up to date on the latest treatment modalities and technology, which enable her to provide the best possible care and strongest results for her patients. 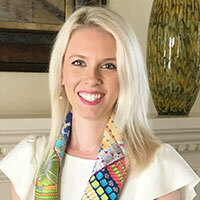 In addition to completing courses through the University of Texas Orthodontic Alumni Association CE Program, she is also an active member of the Spear Study Club. Spear brings together local general dentists and oral healthcare specialists for collaborative learning and complex treatment planning. Dr. Frels is the only orthodontist serving the Victoria area who is board certified by the American Board of Orthodontics. This voluntary credentialing represents Dr. Frels’ commitment to the highest standards of specialty practice and lifelong learning. In order to achieve the certification, she completed and passed peer-developed and externally validated written and clinical examinations. A native of Cuero, Dr. Frels now resides with her husband, Dr. Peter Denton Kaldis, an internal medicine specialist, in Victoria. The couple enjoys traveling, trying new restaurants, and attending sporting events. Dr. Frels is an avid supporter of all things UT: She attends almost every home football game, as well as many away games. When she’s at home, she likes to read and enjoys relaxing and watching a good TV series.